A new architecture triennial launching in the United Arab Emirates next year will challenge "pernicious" western views of Asian, African and Middle Eastern architecture, according to curator Adrian Lahoud. 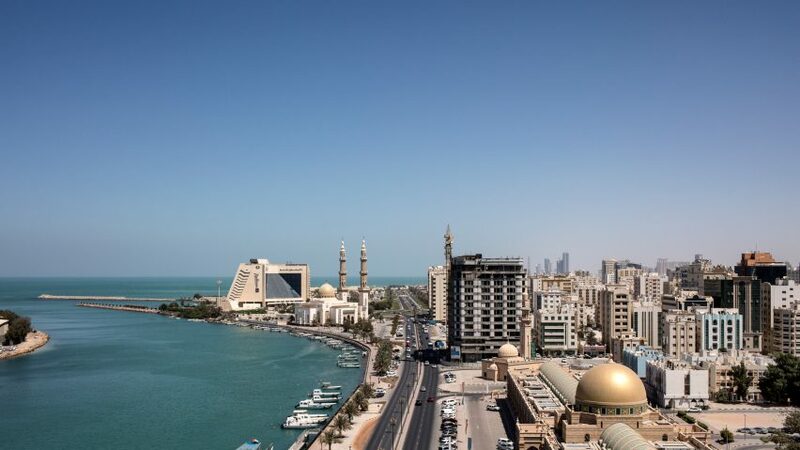 The Sharjah Architecture Triennial, debuting in the Emirati city in November 2019, aims to tackle stereotypes about the region and its architecture. "There's going to be an attempt to rethink architecture beyond a Western European framework," Lahoud told Dezeen. "You get all these orientalist cliches and you find them in all kinds of various forms of knowledge production, and they're continually repeated within the media." Lahoud, who is dean of the school of architecture at the Royal College of Art in London, revealed details of the triennial at a launch event at the Venice Architecture Biennale at the end of May. In an exclusive interview with Dezeen ahead of the launch, he criticised the western tendency to highlight vernacular design, traditional materials and even tribal dress from non-western cultures. "Those kinds of cliches are pernicious, virulent, and objectionable tropes, that really no major international exhibition of architecture that I've seen in decades has been exempt from," he said. "There's a lack of indigenous modernities or futures in those accounts." Triennial will "look beyond the object"
Instead, the three-month-long triennial in port city Sharjah, which neighbours Dubai, will look "beyond a focus on the object, the focus on the form of the object, or thinking about the building envelope as where architecture ends," said Lahoud. "It's important because our perspective of architecture is so dominated by the legacy of Western European forms of thinking," he said. "This is a part of the world that is still involved in various different struggles against colonialism." Looking at architecture in North and East Africa, the Middle East and South Asia, the inaugural event is titled Rights of Future Generations. It will examine how the recent focus on individual rights to things such as health, education and housing have diminished concern about collective entitlements such as rights to natural resources and a benign environment. Lahoud hopes the triennial will help move the discussion ''beyond questions of individual rights to think about collective rights, from the perspective of a future generation". "But it's challenging, as future generations don't exist, so who speaks on behalf of them?" he said, stressing that this is the key question that architecture should be addressing. "The reason it's becoming such a fundamental question and why it's so important to use as a kind of lens to think about architecture and think about cities is because there's no doubt in anyone's minds that we are making massive transformations to the planet at the moment," he said. "These are transformations that will have really fundamental long-term consequences on quality of life." This involves overturning western views on architecture and urbanism, Lahoud believes. "Shelter, for example, assumes that there is a distinction between ourselves and the environment; that the environment is a threat and we have to be protected from it," he said. "That's a core concept within architecture, but not all societies see their relationship to the environment in the same way." Lahoud attacked the way other international architecture exhibitions presented architecture from Africa, Asia and the Middle East. "For example, this obsession with tradition in the vernacular," he said. "This condescending appreciation of creativity under conditions of adversity. Or even the semiotics of architectural materials, bamboo and mud bricks, and so-called other traditional materials. There's always a complete absence of technological sophistication or technological experimentation." He added: "Architects from that part of the world get admitted to international exhibitions if they're in traditional dress, and of course that standard never applies to architects from a North American or Western European context." "The question we should be asking is why does the Western curatorial gaze, whenever it looks out to those parts of the world, basically seek works that only confirms preconceptions of what architecture from that part of the world should look like." Lahoud, an architect, researcher and educator, was appointed dean of the RCA's school of architecture in 2015 when his predecessor Alex de Rijike resigned to focus on his architecture practice dRMM. Specialising in post-colonial nation-building projects and climate research in the context of the global south, Lahoud's recent projects include an installation called Climate Crimes, which is currently on show at the V&A as part of the exhibition The Future Starts Here. He promised to put voices of young people in the regions covered by the triennial at the centre of the show, although he conceded that three months would not be time enough to address the scale of issues they face. "The thing that excites me the most is the opportunity to make a space for dialogue, to create a platform for an emerging generation of architects, of scholars, of artists, planners, urban designers, who are working in parts of the world that sometimes don't have access to really basic things like national archives, to a documentation of their own histories because of colonialism, because archives were taken back to Europe or destroyed." Photography of Sharjah is by Ieva Saudargaitė.